Ahhh Jamaica, the chic hotels, pristine beaches, fantastic local cuisine, and stunning landscapes – we can’t get enough of it! 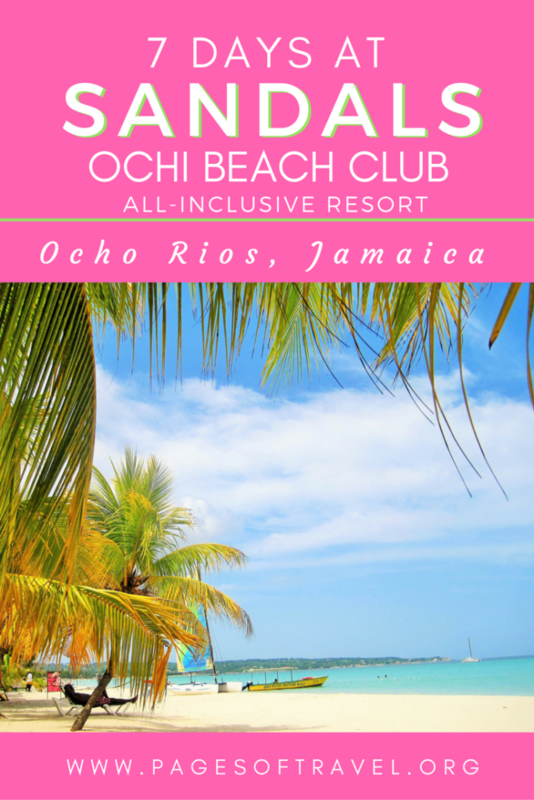 We spent 7 days at Sandals Ocho Rios, Ochi Beach Resort for our honeymoon and couldn’t have been happier with our stay at this fantastic all-inclusive resort! Upon arriving in Montego Bay, Jamaica we were taken to a VIP lounge for Sandals guests while we waited for our shuttle to arrive. Once inside the lounge, there were many different snacks and beverages. 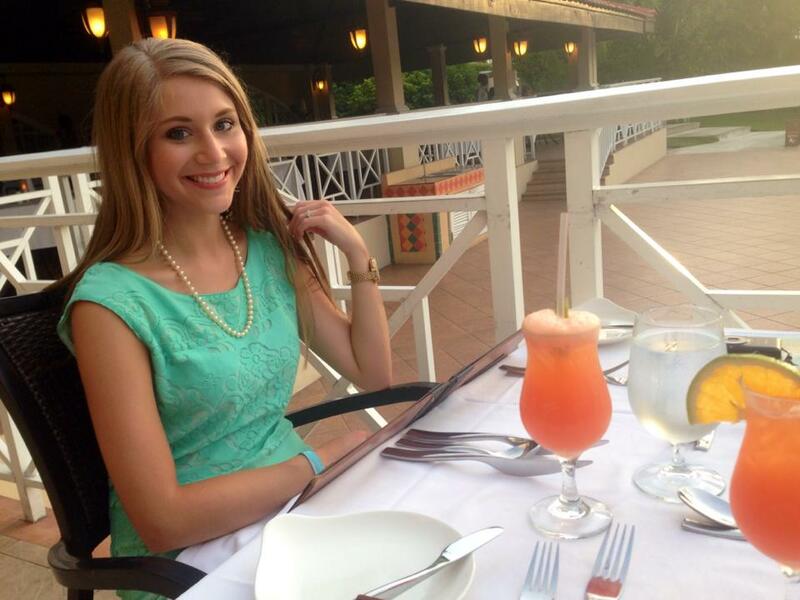 As you may know, Jamaica is known for its rum so we immediately had to try a famous rum punch while we waited! After we had a shuttle bus ride to Sandals Ocho Rios, which was roughly 1 1/2 hours from the airport in Montego Bay. But even with the long bus ride, we had plenty to view out the windows. 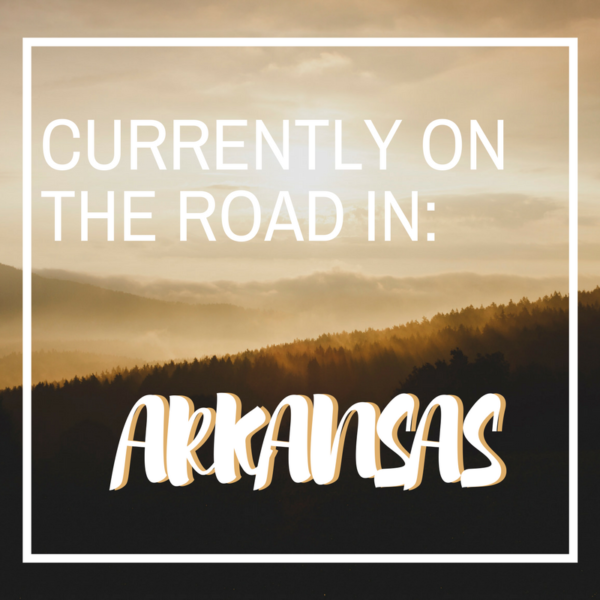 We also had a fabulous time visiting with other people heading to other resorts, and our own too! Travel tip: While monetary tips are not necessarily allowed on the resorts in Jamaica it is recommended to tip your drivers, butlers, and anyone who might be taking you on an excursion. 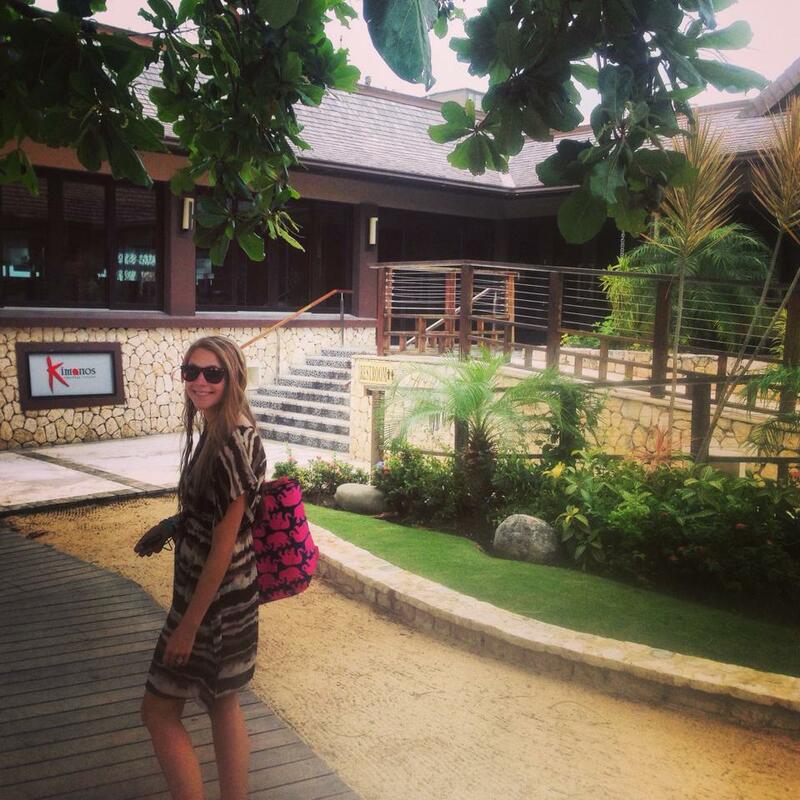 Upon arriving at Sandals Ochi Beach Resort we were taken to a check-in area. 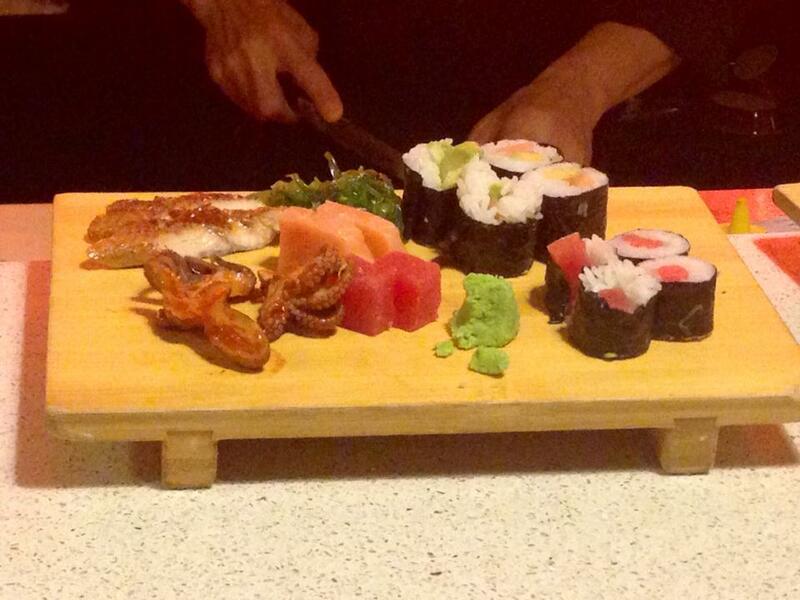 The staff quickly brought us drinks and a small snack while we began our check-in process and waited for our butlers. When our butlers arrived they drove us on a golf cart to our Poolside Villa and showed us our room at Sandals Ocho Rios. 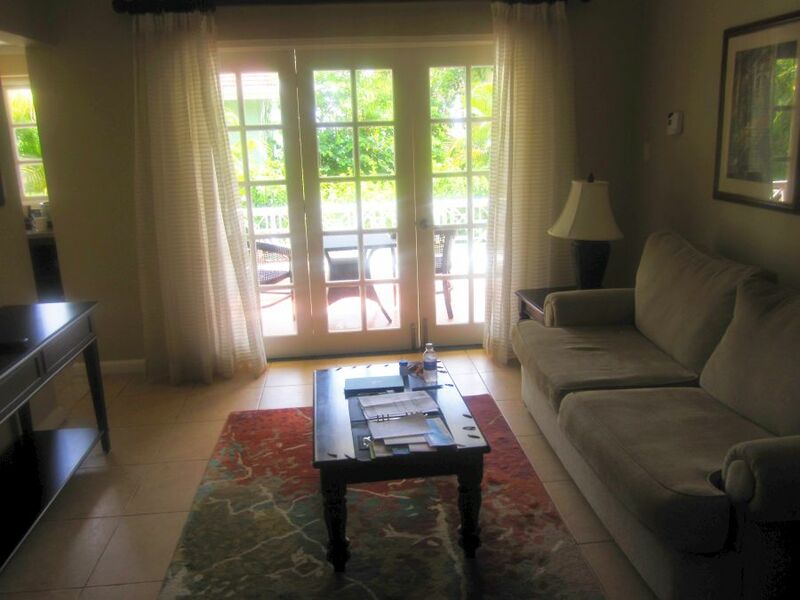 This included a living room area, bedroom with king-sized bed, bathroom, small kitchenette, patio with dining table, and a semi-private pool. We also were given a bottle of champagne upon arrival and access to a large safe to store valuables. 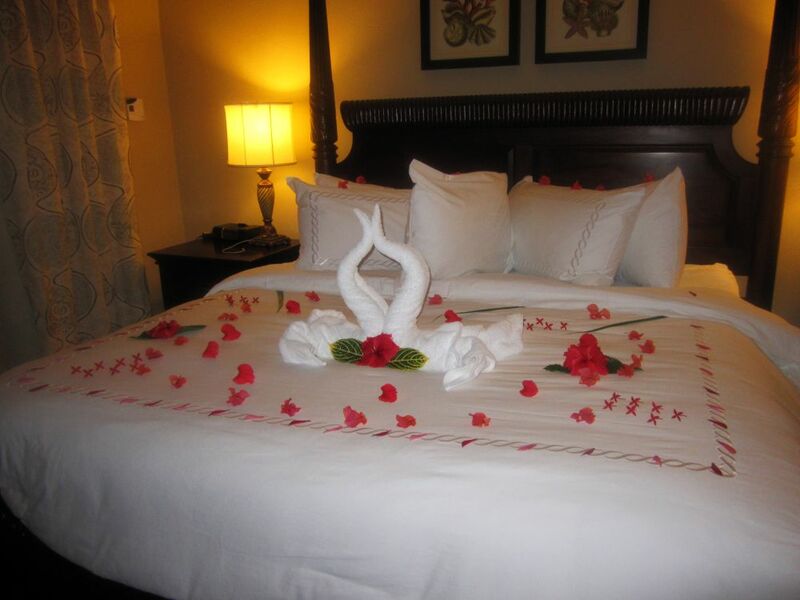 Our butlers often left flower petals and towel designs on our bed! The semi-private pool at our villa. After unpacking we immediately went out to explore. Having been cooped up in a plane we opted to walk around the resort rather than call for our butlers to take us by golf cart. After walking around the main house we decided to eat at the Manor Restaurant (more on the restaurants at Sandals Ocho Rios later) which served mostly Jamaican cuisine. After, we began looking for the ocean side of the resort only to find out that the resort is actually divided by a road in which you have to take a shuttle to get to the other side. Typically the shuttles run every 3 minutes so it isn’t much of a hassle to get back and forth easily! The first excursion we went on sponsored by Sandals Ocho Rios was the Dolphin Swim at Dolphin Cove which is one of the most expensive excursions offered by this resort and I’m going to tell you why we highly discourage you from participating in this activity. 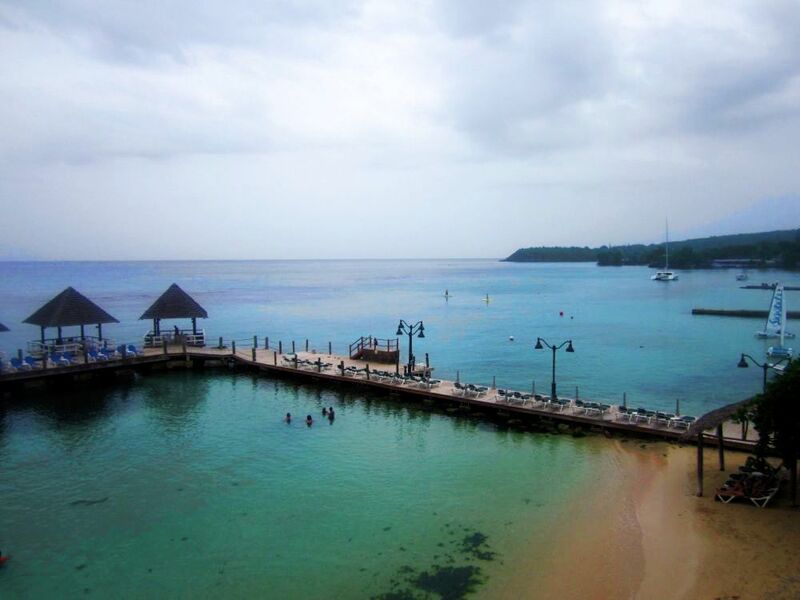 Before visiting Sandals Ocho Rios I had always wanted to swim with the dolphins. I’ll admit I was naive in knowing much about ecotourism at the time and thus, I did it. Bucket list check, swim with the dolphins. But while we were there I felt off. I couldn’t quite put my finger on it but something just didn’t feel right. After coming home, I started digging into some research about ethical animal tourism and found some pretty disturbing stuff. Many of these dolphins are captured from the wild (all this time I was a person who believed they were rescued) placed in small confined spaces and forced to breed. You can read more extensively about it here. I say all of this to simply state that there are many other excursions you can enjoy at Sandals Ocho Rios that are NOT inhumane. Don’t make the same mistake we did. We aren’t perfect, we just ask that you research the places you are thinking about visiting as extensively as you can. Now, this is a place that we can get behind! The Blue Hole was one of the most beautiful places we have ever been to. Its crystal blue waterfalls are every bit of the picturesque Jamaica that you dream of. However, since the Blue Hole isn’t recognized by the Jamaican government as a “tourist attraction” (at least it wasn’t at the time of our visit) there are some things to think about before you make your trek to this otherwise majestic place. The Blue Hole is on privately owned land, so as far as we understood it, any injuries, loss of property, etc. are not covered by anyone but yourself as you are completely liable if you go. Let us also say that due to this, this is not a “Sandals sponsored excursion” and our butlers were skeptical when we told them of our plans. We hired a private taxi driver, We left Sandals around 8 am and would highly recommend going early in the morning as later in the day can get busy because it has become more popular with cruise ship tourists. If you are a cruiser get there as early as you can. Since we were the first people there, our guide Neil asked if we wanted to go just the three of us and of course we agreed! He first took us down to the bottom part of the falls, where you will see a lot of the photos of the wide falls and flags/signs hanging on trees. There we jumped into the water for the first time, but be careful! It is so cold it can nearly take your breath away. Note: The taxi driver we used and loved has since moved from Ocho Rios but there are a number of other taxi drivers you can hire. Just made sure you read reviews extensively and if you can, correspond with the driver via email prior to your departure. 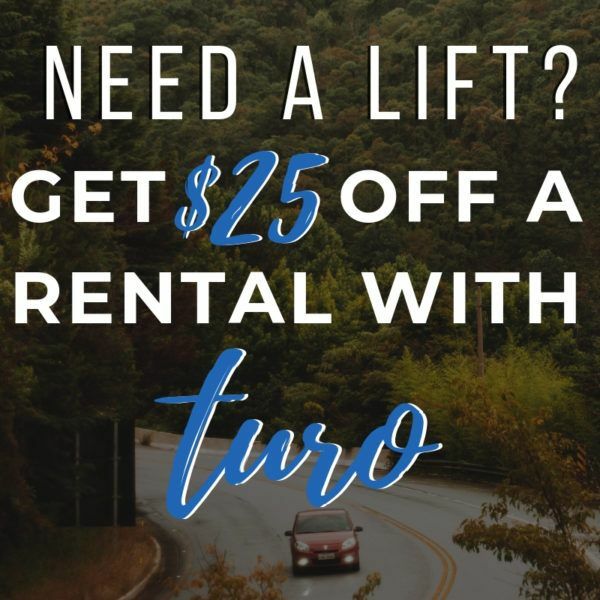 If you aren’t comfortable with hiring a private driver on your own here are some tours for The Blue Hole – make sure to book ahead because they tend to fill up quickly! After, we climbed back up Neil took us to the upper part of the falls. This was a little bit of a hike and some of the terrain was deceivingly hard work to walk across. However, Neil helped us find easier spots to cross in some areas. By no means is this a hiking expedition, but we would not recommend this activity for those who have health conditions, small children, or for pregnant women. Neil was awesome with taking pictures, he would inform us of certain places that he knew would make a good shot. 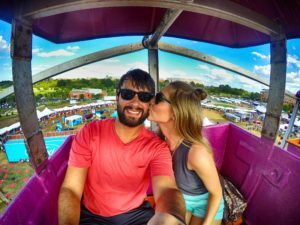 At the time we had not purchased our GoPro so we used an iPhone 5s with Lifeproof case. Neil also showed us places to slide down rocks, swim, rope swing, and places for cliff jumping. At the very top of the falls was the large cone-shaped falls that we got to climb down into. Next, we had to wiggle ourselves backwards into a hole while lying on our stomachs, one at a time. Neil was the first one in and helped us as we climbed down into the fall. 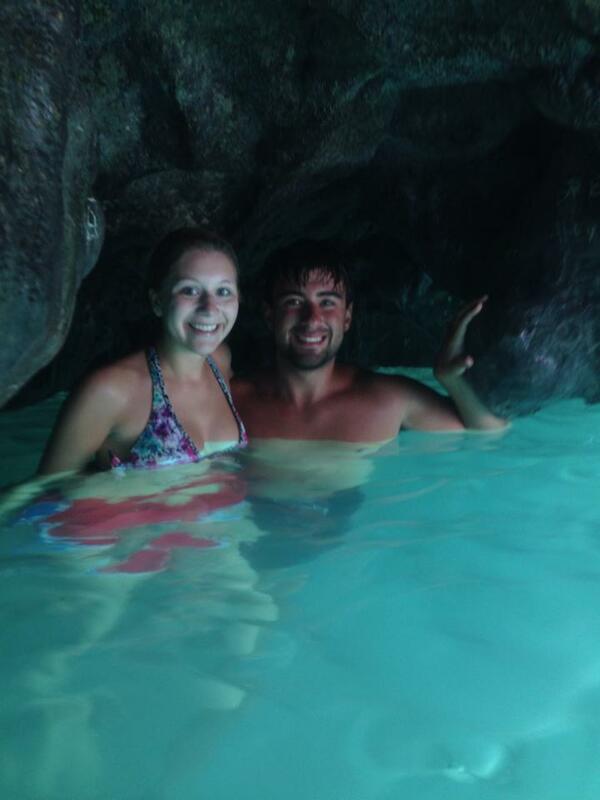 When we dropped down the hole there was a pool and cave that was inside the large cone waterfall! Definitely the coolest part of our trip to Blue Hole! 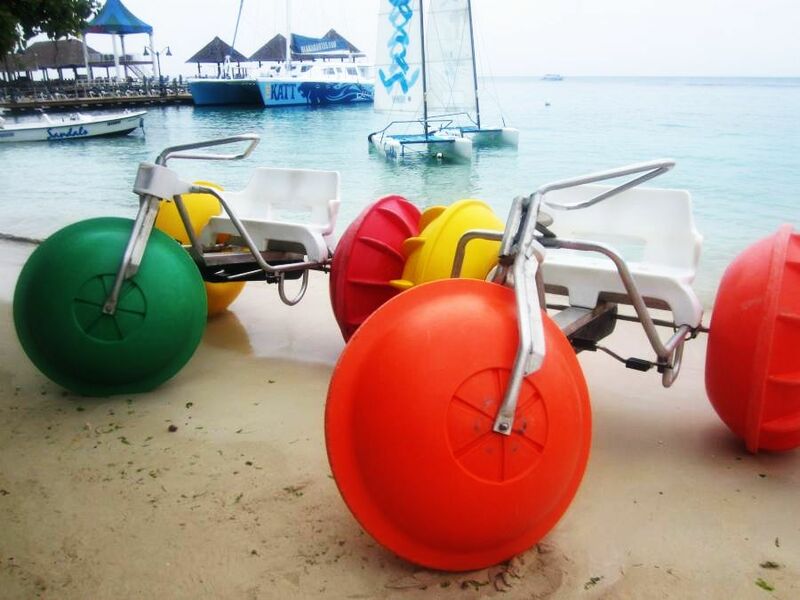 Like many all-inclusive resorts, Sandals Ochi Beach Resort has many free activities to enjoy while on the resort. We love kayaking so naturally, we had to take out a kayak while we were there a few times. We also went snorkeling one day (sign up for a time right away because they book up fast!) and while the waters were rough, it was still absolutely beautiful and we were able to see a ton of fish swimming around in the beautiful coral. 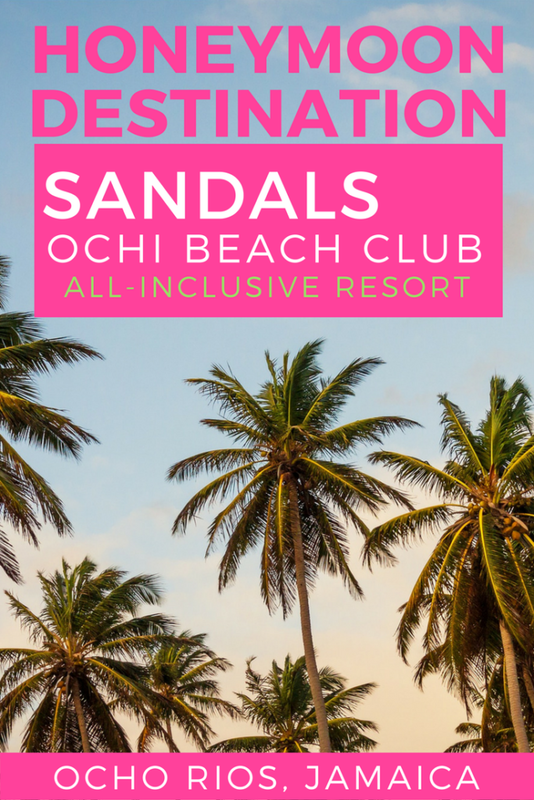 Other water activities that Sandals Ochi Beach Resort has include PADI certified scuba diving (they even have classes to learn how to scuba dive! ), aquatrikes, windsurfing, sailboats, and paddleboards. 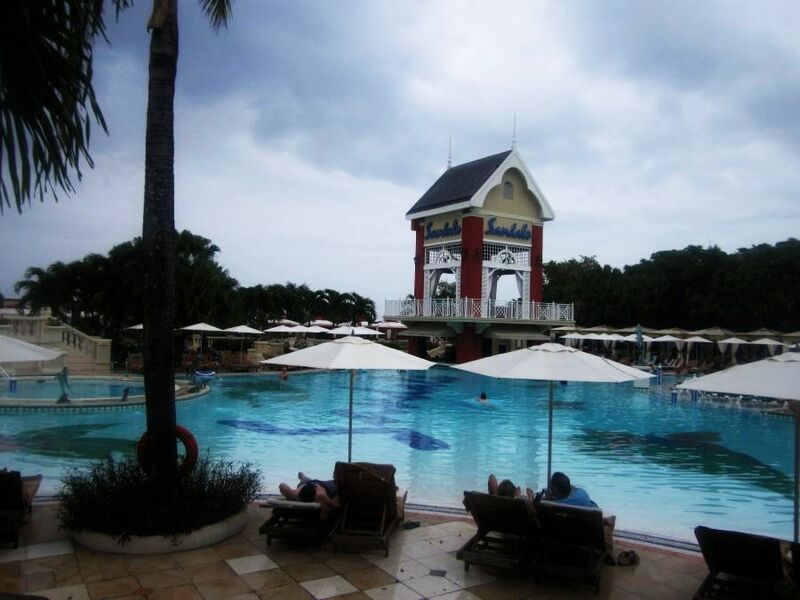 If water sports aren’t your thing you can always relax at the beach or by one of the many beautiful pools. There is also shuffleboard, table tennis, bocce ball, lawn chess (it’s huge! ), squash, horseshoes, rock climbing, croquet, tennis, beach volleyball, and billiards – whew I need to take a breath! We also decided to get massages at the Red Lane Spa located on the property and they were still some of the best massages we’ve had to date! After getting a massage make sure you check out the plunge pool and sauna for more relaxation. At night the fun doesn’t stop! There are nightly live shows and bands, karaoke, and themed parties – like Caribbean night with fire shows, dancing, and a giant buffet on the beach. 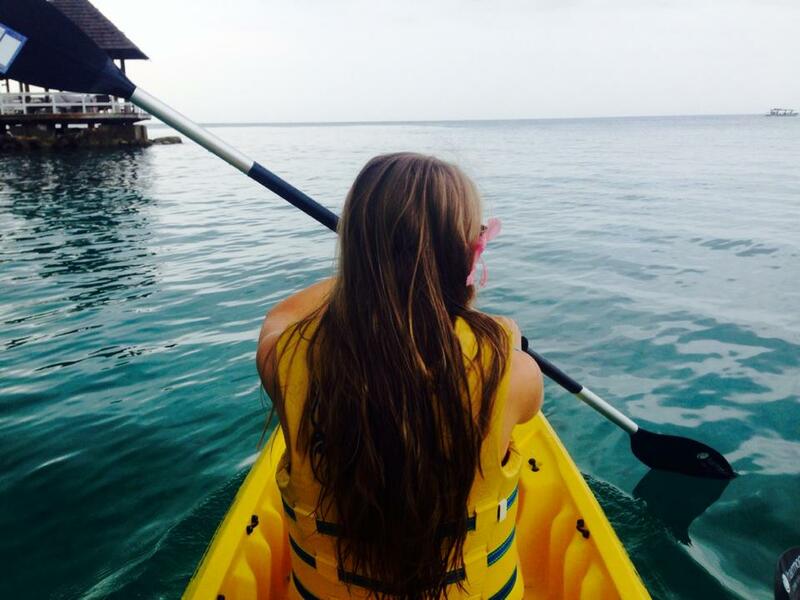 It’s safe to say that there are countless activities at Sandals Ocho Rios and you’re sure to find something you enjoy. 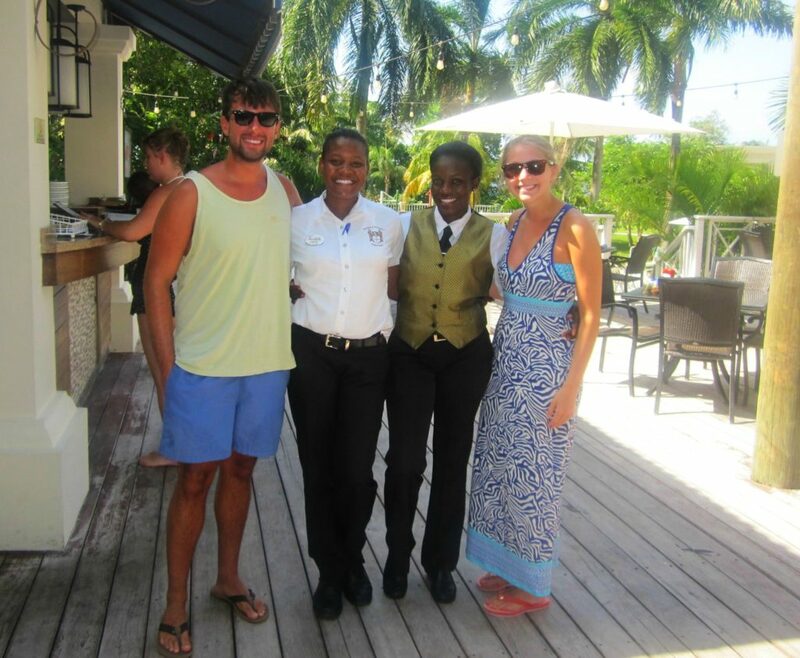 We cannot say enough to applaud our amazing butler’s, Necia and Dacia, at Sandals Ocho Rios. Here are some of the added perks of having butler service. 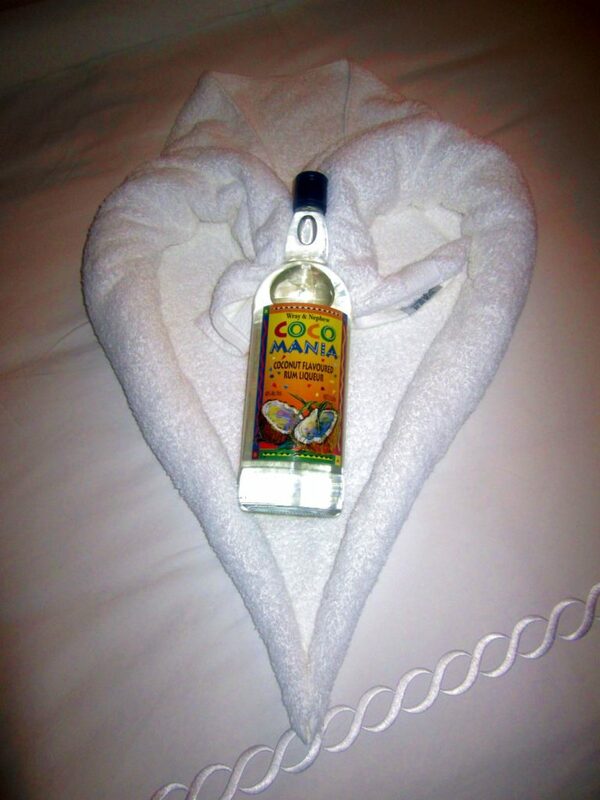 Gave us complimentary Jamaican rum and restocked our bar. Not to mention they spent their night off with us so we could get to know them better! Our amazing butlers Necia and Dacia! These two are truly the best! If you are planning to visit this or any Sandals resort for a special occasion we would highly recommend the butler service. However, if you were going for a simple vacation you could definitely opt out. 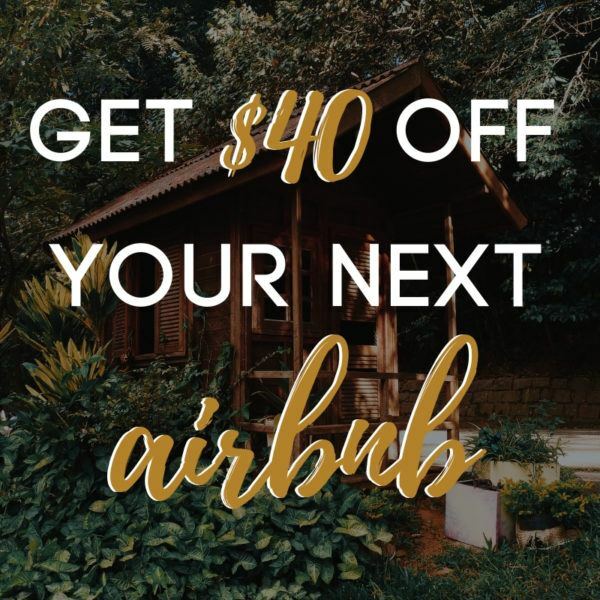 Instead, you could book your reservations and transportation yourself. We’re huge foodies so we were a little concerned about the taste and quality of the food at Sandals Ochi Beach Resort but with over 15 restaurants and 11 bars, you definitely won’t be going hungry at Sandals Ocho Rios! 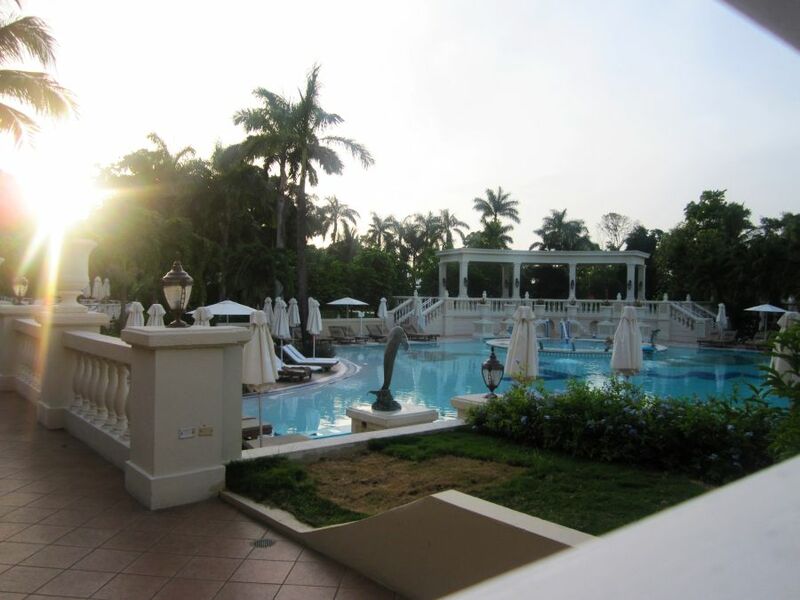 We personally enjoyed The Manor Restaurant for their Jamaican cuisine, delicious rum punch, and views of the main pool. The rum punch at The Manor Restaurant was fantastic. 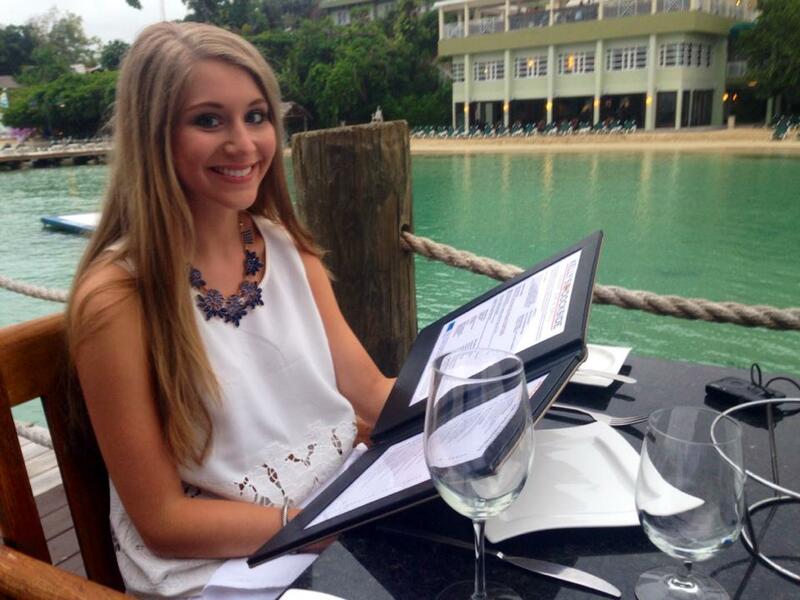 We also enjoyed Soy Sushi Bar for a quick bite to eat, Valentino’s Italian for some delicious pasta entrees and sweet cocktails, and Kelly’s Dockside for the gorgeous views of the ocean – definitely go for sunset! 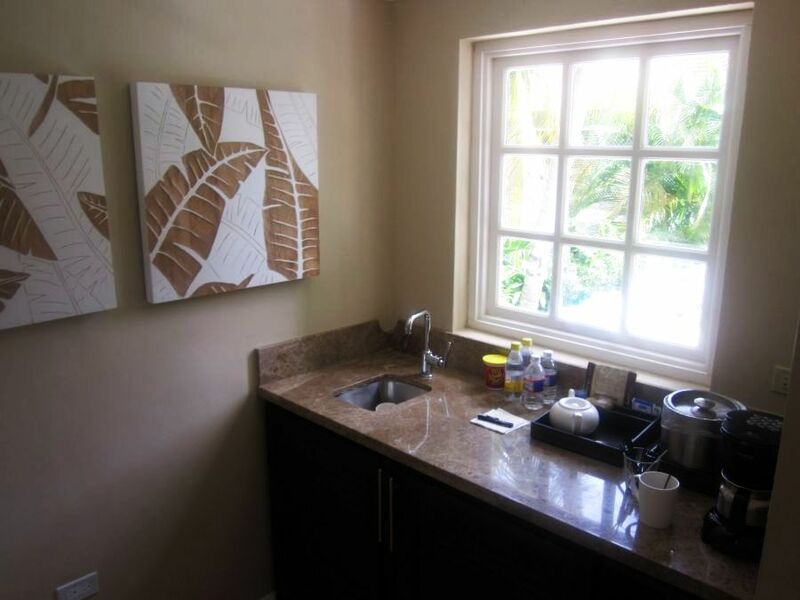 We also frequently ordered room service in the morning and would put the items in the fridge to have later in the evening – there is just so much to do during the day! As for the beverages, we loved having the ability to create and try various cocktails and Jamaican rum. We found that none of the drinks we had were watered down or skimpy on the spirit. Our Poolside villa also came stocked with wine, beer, and spirits. Some of the Jamaican rum we received from our butlers. Are there any Jamaican travel tips you have? What hotels/resorts would you recommend we visit next time? Thank you for sharing this wonderful post! We leave for our honeymoon in 2 days & this just made me so excited!!! Hope you have a fabulous time Nicole! We really loved staying at an all-inclusive for our honeymoon because it was so much less to worry about. 🙂 Congrats on the wedding! Best of luck to you both. Sounds like you had a blast! The underwater cave diving looks like something I must try if I ever go there! AWesome places with loved one! Definitely for honeymoon ?? I’ve been to Jamaica but was in Montego Bay. Our hotel wasn’t as nice as this one so I won’t recommend it….lol!